Great news! Our Q4 RT training session will be held in Los Angeles, CA on November 4-5, 2014! We do have a limit on how many people we can effectively teach, so please register as soon as you can to make sure you get a seat. If you can't make LA, please feel free to suggest a future location by dropping us a line at training@bestpractical.com! Also, we still have a few spots in our upcoming Boston training! If you haven't registered yet but want to attend, now is the time! This training will introduce you to the new features in RT 4.2 as part of a comprehensive overview of RT. Whether you're an old hand at RT or a recent convert, you'll have a good understanding of all of RT's features and functionality by the end of the session. The first day starts off with a tour of RT's web interface and continues with a detailed exploration and explanation of RT's functionality, aimed at non-programmer RT administrators. We'll walk through setting up a common helpdesk configuration, from rights management, constructing workflows and notifications, and the basics of Lifecycles. The second day of training picks up with server-side RT administration and dives into what you need to safely customize and extend RT. We'll cover upgrading and deploying RT, database tuning, advanced Lifecycle configurations, writing tools with RT's API, building an extension, and demonstrate how to extensibly alter the web UI and internal functions. It goes without saying that you'll get the most out of training if you attend both days of the course, but we've designed the material so that you can step out after the first day with a dramatically improved understanding of how to use RT. For both days, the cost is USD $1,495. A single day is USD $995. Each class includes training materials, a continental breakfast, and snacks (lunch is not provided). If you'd like to pay with Visa, MasterCard or Discover, please visit Best Practical's online store. Unfortunately we are unable to accept American Express or PayPal. If you'd prefer to pay with a purchase order, please email us at training@bestpractical.com. Be sure to include: if you want to attend both days or a single day and the full names and email addresses of attendees. Finally, please contact us at training@bestpractical.com for discounted pricing if you are from an academic institution or if you'd like to send more than 3 people. Join us for our Q2 Request Tracker training in Dallas! Hello! Best Practical is pleased to announce our second Request Tracker training for 2014! We will be in Dallas, Texas on May 20-21. We do have a limit on how many people we can effectively teach, so please register as soon as you can to make sure you get a seat. If you can't make Dallas, we will have upcoming sessions later this year in Boston, MA and Los Angeles, CA. Please let us know if you have a suggestion for a future location by dropping us a line at training@bestpractical.com! Please contact us at training@bestpractical.com for discounted pricing if you are from an academic institution or if you'd like to send more than 3 people. Thanks for your support of Request Tracker! Don't miss Best Practical's first Request Tracker training of 2014 in London! Just a reminder that Best Practical's first RT training is taking place on March 19-20 in London, UK. This will likely be our only non-US public session this year. This training will introduce you to the new features in RT 4.2 as part of a comprehensive overview of RT. Whether you've been using Request Tracker for years or are a recent convert, you'll have a good understanding of all of RT's features and functionality by the end of the session. For both days, it is USD $1,495 for one person. This includes training materials, continental style breakfast, and snacks. You can register by heading over to our shop to pay via credit card (Amex not accepted, unfortunately.) You can also drop us a note at training@bestpractical.com if you'd rather we send an invoice. Finally, if you're from an academic institution, or would like to send more than 3 people, let us know so we can give you a bit of a discount. We're always happy to answer any questions, so please don't be shy. In RT 4.2 we've updated the scrips configuration pages and the changes will save RT admins a bunch of time when managing scrips. Specifically, you can now apply scrips globally or to selected queues on one simple configuration page. RT's global scrips work for most notifications, often with just some updates to the global templates. If you want different templates for specific queues, you can create a queue-specific template with the same name as the global template and the global scrip will use that template for notifications on that queue. But what if you want to disable a notification for just one queue and leave it on for all the others? In previous versions of RT, this meant disabling the global scrip, then creating a new scrip in each queue that still needed it. In RT 4.2, this is now much easier. For example, let's assume we have an Office queue for internal office requests and everyone agrees we don't need to see the 'On Resolve' notification when the new staples have come in. First we go to Admin > Global > Scrips and click on the "On Resolve Notify Requestors" scrip. 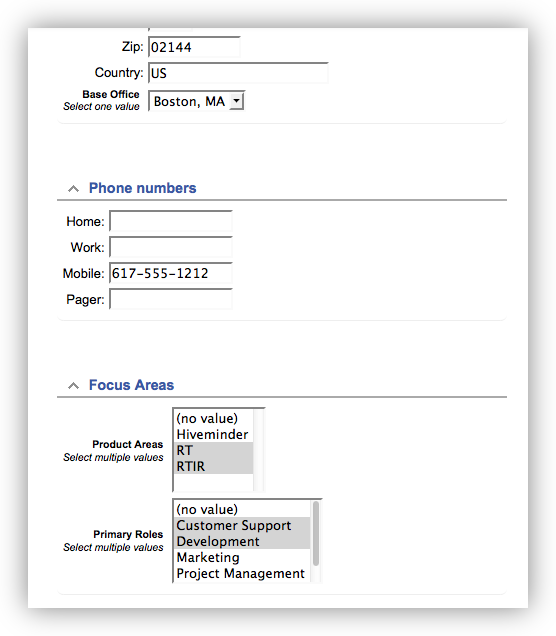 On the Basics page you'll notice a new Applies to label showing "Global" and a check box to enable and disable the scrip. You could previously disable scrips in a dropdown menu in the same location, but the other items in the dropdown were the scrip stages, so users often didn't know the Disabled option was in there. The current options are fine for our case, so we click on the Applies to link in the submenu. The resulting page says "Applies to all objects", meaning the scrip is currently global. Below that is a checkbox you can check to remove the scrip from all objects. We check that and click Submit to see the new Modify page. The new page displays all of our queues with checkboxes so we can check all queues but the Office queue. You can also change the scrip stage (normal or batch) or change the template at this point. After we submit, we see the scrip has been applied to the selected queues. You can now easily move scrips between queues or make it global again. From the scrip listing pages, at both the global and queue level, you can now also manage the order in which scrips run. For default configurations, this isn't an issue for most notifications, but as you add more scrips you sometimes want to guarantee that one scrip will run before another for the same sort of update (comment, correspond, etc.). To change the order, just click the Up and Down links on the right. You'll also notice we now separate regular scrips and batch scrips to make the running order more clear. Batch scrips run at the end of a transaction after all other scrips have run. Scrips that are not applied appear at the bottom of the screen and you can easily select and apply them either globally, if you're on the global modify page, or on the current queue if you're on a queue-specific scrip page. These updates should make it much easier to reuse scrips across a portion of the queues in your system and selectively apply them. The new scrip display and ordering features should also make it easier to view and control when they run. If you'd like to learn about more new features in 4.2, take a look at the new feature overview. In RT 4.2 we've added some new configuration options that allow you to cleanly organize your custom fields, improving the look of pages and making it easier to view and update custom field data. The first entry under RT::Ticket will create a new "Product Details" grouping and include the three custom fields listed. You can add more entries and custom fields to set up as many new groups as you need. If you have additional custom fields not assigned to a group, they will appear in the standard Custom Fields portlet as usual. The ticket groupings appear on the ticket create, display, and update pages. The ordering of the custom fields in each group is still controlled by the queue configuration. You can find this by going to Admin > Queues, clicking on a queue, then selecting Custom Fields > Tickets in the submenu. Just click Up/Down on the configuration page to change the ordering. 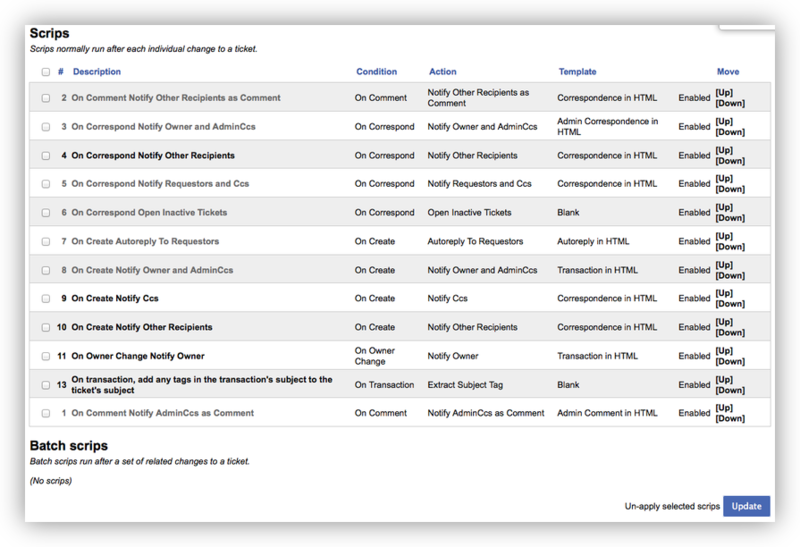 The custom field groupings also apply to RT's self service pages. You might want your customers to set some custom fields to help with support requests, so you can give them permission to see and edit selected custom fields even though they are unprivileged users. They can then fill out some fields as part of their support request. You can find details on the new custom field grouping features in the RT_Config documentation. We think you'll find this a nice way to bring some order to you custom fields. If you missed some earlier posts, you can find more new RT 4.2 features in the new feature overview.